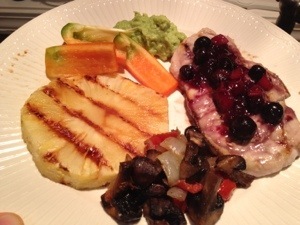 Pork loin cutlets with berry sauce, grilled pineapple without syrup, guac and bells (using bell pepper wedges like chips for eating guacamole), roasted onion, mushrooms, and tomatoes. The pork loin with berries was outstanding with a little bit of gauc in each bite, and can you imagine how stunning those colors are together? 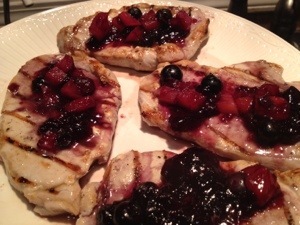 Next time I will garnish the pork with the gauc as well as berries when I plate it. As my husband often reminds me: food is eaten first with the eyes. 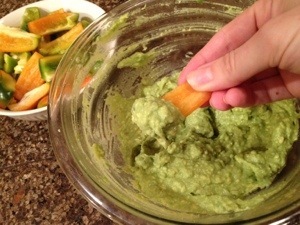 Here’s a picture of gauc and bells. 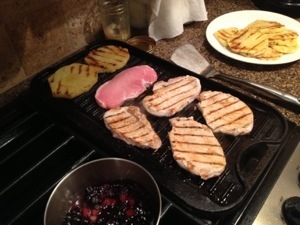 Here’s a picture of the grilled pineapple slices and pork loin just being turned. Do you have a stovetop grilling pan? I love mine from Lodge! Combine over low heat, stirring until smooth. This amount nearly filled my emptied squeezable ketchup bottle. Simmer uncovered in small saucepan until thick sauce forms, approx 10 minutes, stirring occasionally. We pick and freeze berries each summer from nearby brambles or berry farms for economical berries all year long. Ripe blackberries and blueberries are the sweetest, so I always include some in a compote, and add extra if using a tart berry like cranberry.